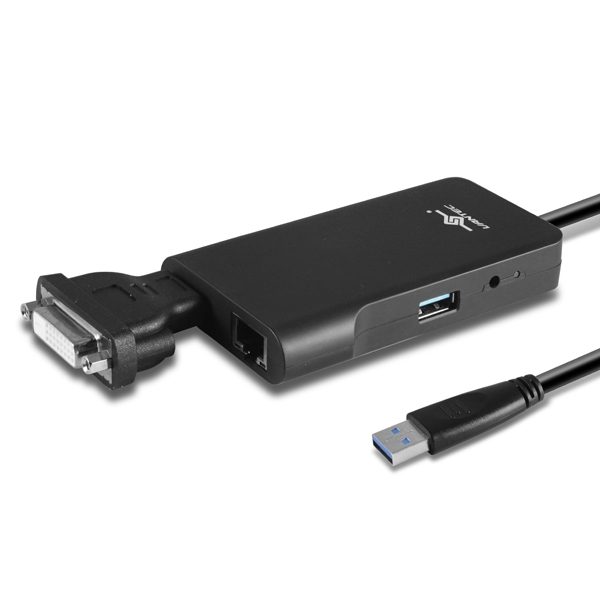 The Vantec USB 3.0 Mini Docking Station with HDMI/DVI/GbE is design to be quick and easy way to add additional monitor/projector, wired to Gigabit Network, and connect USB 3.0 device to your Ultrabook, Hybrid table or laptop computer. 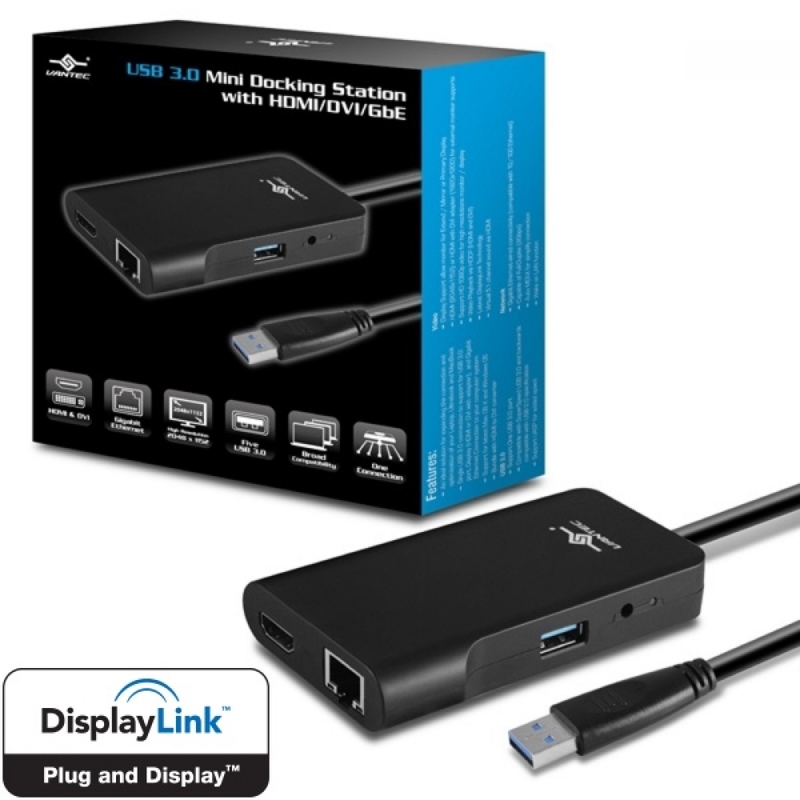 Connected through an available USB 3.0 port, this Mini Docking Station will provide more display space or mirror to a HDMI projector or large screen monitor in full HD mode. The wired RJ-45 Gigabit Ethernet enabled your system with link speeds up to 1000 Mbps (compatible with 10/100 Mbps Ethernet networks). The Mini Docking Station will also have an additional USB 3.0 hub port for adding other USB devices. This small and compact device will make a good companion for your portable system to help increase productivity and efficiency. Technical notes from DisplayLink on Mac OS X 10.13 or 10.14 Video Function not enabled by default due to OS X security issue. This affects the following device using DisplayLink Drivers. Click here for more set up information to configure Video function. 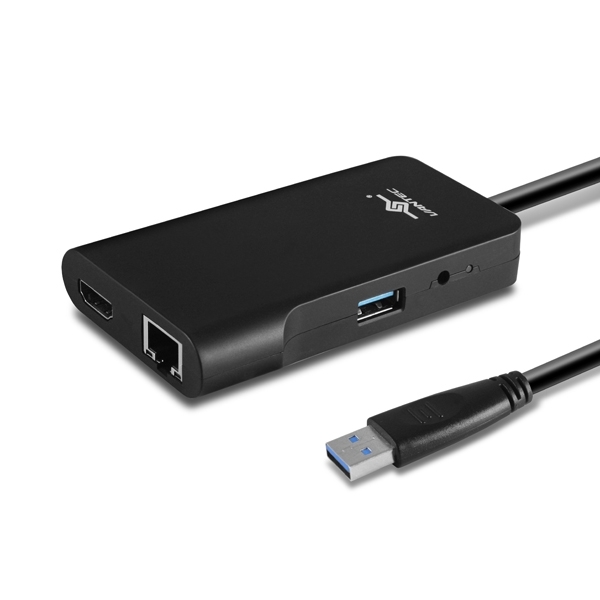 Sometime Windows is shutting down the USB Root Hub on your system to save power, that may be the cause of the monitor issue not waking up correctly. You can correct the problem by doing the following changes. Go into Windows 10 "Setting" > "Power and Sleep" > on right side "Additional power setting"
Select "Change plan settings" on the right of each > "Change advanced power settings" > "USB setting" > "USB selective suspend setting" > change setting to "DISABLE"
Done one, now do for all the rest (Balanced, High Performance, Powert Saver or others). After changing all, restart computer.